Utica FFA members Aramaik Wright (left to right), Kim Hornyak, Trina Orr, Shaeley Warner, Emily Hill, Rachel Dickson and Seth Blake joined former Fredericktown FFA members Linden Scheff and Neil Overly (center), for the special event. 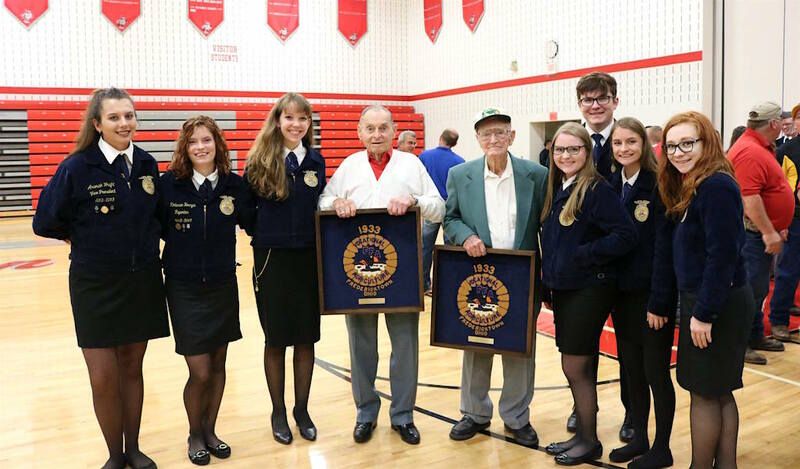 FREDERICKTOWN, Ohio — Two men in their 100th year of life, who were part of the Fredericktown FFA in 1933 and among the first to wear the official FFA jacket, helped commemorate its history during a special ceremony Sept. 8 at Fredericktown High School. Linden Scheff and Neil Overly, both 99, helped unveil a new historical marker constructed with funds from the community and the Ohio History Connection, which pays homage to former FFA adviser Gus Lintner, and his efforts to design what would eventually become the organization’s nationally recognized blue and gold jacket. Overly said the 1930s were a tough time economically, and his father barely had enough money to buy his son the jacket, but he was grateful for the gift. “It was just a plain jacket, but it was a good one,” Overly said. Members of the Utica FFA, with the new memorial. The jacket looked much the same as FFA jackets do today — made of blue corduroy with gold emblems and lettering. 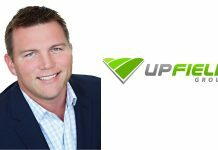 The un-insulated jacket is a simple jacket, but one the FFA organization has embraced. 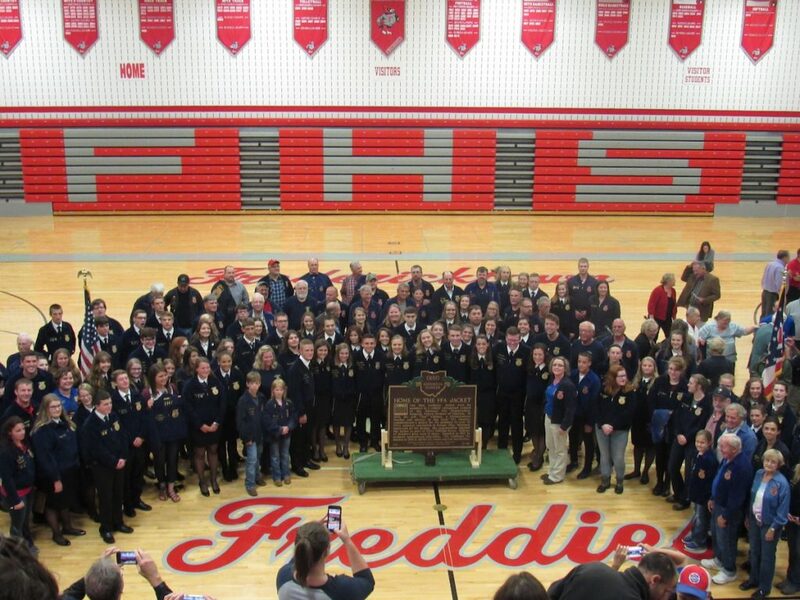 The reason their adviser had the jacket made was because in 1933, the Fredericktown FFA Band was chosen to perform at national convention in Kansas City, Missouri, and members needed something appropriate to wear. Scheff said he didn’t think he was good enough to go with the group and perform in Kansas City, but his adviser convinced him otherwise. “It was quite an honor,” said Scheff. After high school, both men spent their lives farming. 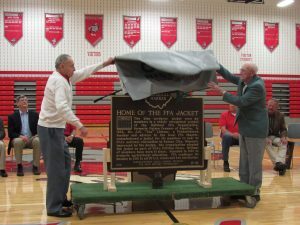 The unveiling ceremony was held inside the Fredericktown High School gymnasium, where the two men uncovered a bronze Ohio historical marker weighing 225 pounds, with an inscription that tells the story of the jacket and how it all got started. Other FFA chapters were also in attendance, with a crowd of about 400. 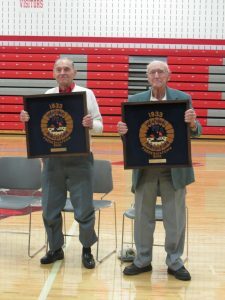 For their efforts, both men received large plaques with re-prints of what the back of their original FFA jacket would have looked like — complete with the FFA emblem and a brass nameplate. Scheff said he plans to display his plaque inside the old Fredericktown School House. Overly said he hopes to find some space to hang his plaque inside his own home, but so far the weight of the thing is proving a challenge to mount. The current Fredericktown FFA adviser, Debra Burden, said it was a memorable experience for the whole chapter and community. 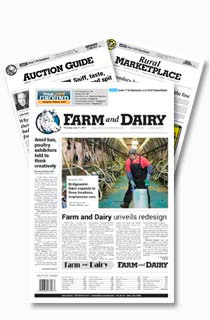 The public was asked to bring their own FFA jacket, and many did. “They (students) were excited to see the older members pull out their jackets and see the differences,” Burden said. 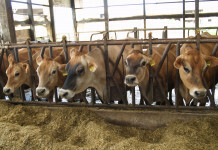 Holly McClay, former member and the current Ohio FFA vice president, said she didn’t realize just how many former FFA members were in the Knox County area. “It was really awesome to have the support, not only from our own chapter, but also the other communities,” she said. 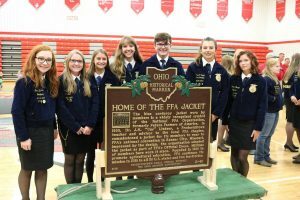 In addition to the memorial, which stands about three feet tall, the village of Fredericktown also announced new signs that will be posted at the various entrances to the village to let motorists know about the FFA history. The memorial itself will be placed outdoors, somewhere near the front of the high school. The full crowd of FFA supporters who attended the ceremony.